This is our new product for our Daz 3D store: EJ Body Shape And Detail Morphs for Genesis 8 Female(s) is a pack of 118 morphs, and 7 typical shapes of the female body. You can use them to add natural and detailed features to your characters, or to build fresh new bodies from scratch just with this pack! A must have for Genesis 8 Female! Made after a deep study of what physical features needed to be available as morphs, these morphs have the shapes that you've been missing to turn a 3d character into a living woman. This is our new product for our Daz 3D store: Suteki Mix and Match Expressions for Sakura 8 And Genesis 8 Female, a must have anime and manga expression pack for Sakura 8 and Genesis 8 Female(s), that consists in expressions organized in three folders (Full Face, Upper Face, and Lower Face), and you also have pose control ERC dials to apply each full face expression. This is our new product for our Daz 3D store: Cool And Quirky is a must have expression pack for Charlotte 8 and Genesis 8 Female(s), that consists in expressions organized in three folders (Full Face, Upper Face, and Lower Face), and you also have pose control ERC dials to apply each full face expression. 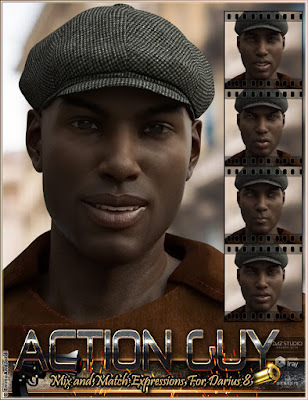 This is our new product for our Daz 3D store: Action Guy Mix and Match Expressions for Darius 8 And Genesis 8 Male(s), a must have expression pack for Darius 8 and Genesis 8 Male(s), that consists in expressions organized in three folders (Full Face, Upper Face, and Lower Face), and you also have pose control ERC dials to apply each full face expression. This is our new product for our Daz 3D store: EJ Hiroshi And Masao For Genesis 8 Male is a character that includes 2 alternative shapes for head and body: EJ Hiroshi is a lean muscled ideal model, and EJ Masao is a more stocky shape, inspired in Sumo fighters. 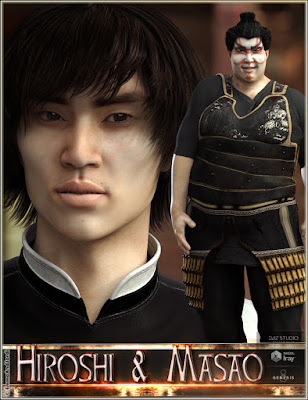 The textures that you can use with Masao or Hiroshi include many possibilities from casual to samurai warriors, ninjas, Kabuki actors, Oni demons, karate fighters, Emo-Gothic guys, vampires, top models or common people. You also have 4 skin tones to get different looks.